The Tampa Bay Lightning have signed free agent center Valtteri Filppula (FIHL-poo-luh, VAL-tuhr-ee) to a five-year contract today, vice president and general manager Steve Yzerman announced. Filppula, 6-foot, 193 pounds, played in 41 games with the Detroit Red Wings last season, recording nine goals and 17 points. He ranked fifth among team forwards for assists (8) and points. Filppula’s 17:46 in average ice time was also fourth among Red Wings forwards. He won 179 of 323 (55.4 percent) of face-offs last season to lead the team. 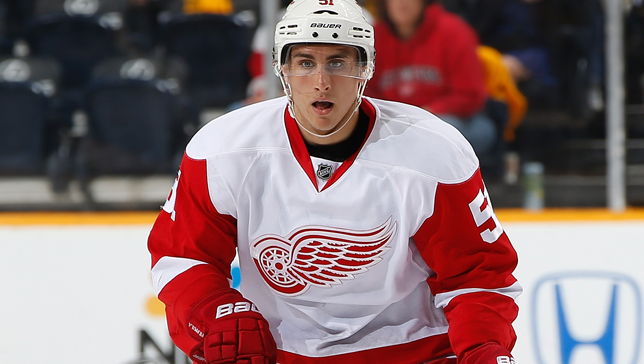 Filppula also played in all 14 Stanley Cup Playoff games for Detroit last season, recording two goals and six points. During the NHL lockout he returned to his native Finland to play for Jokerit of the Finnish Elite League, where he posted six goals and 15 points in 16 games. Filppula led all Detroit centers with a 55.4% face-off win percentage during the 2012-13 season & averaged 17:46 TOI per game. A native of Vantaa, Finland, Filppula has played in 483 career NHL games, all with the Red Wings, registering 100 goals, 251 points, 15 power-play goals and 12 game-winning goals. He has averaged 16 minutes or more in average ice time in each of the previous six seasons, including a career-high 18:15 in 2011-12, the NHL ‘s last full season. That year he also established career highs for games played with 81, goals with 23, assists with 43 and points with 66. Filppula has excelled in the face-off circle during his time in the NHL, posting a 52.2 career win percentage. Filppula, 29, won his first Stanley Cup with Detroit in 2008. He has played in the postseason in each of his NHL seasons with the exception of one (2005-06), amassing 105 games played along with 19 goals and 57 points. Detroit’s third-round pick, 95th overall, of the 2002 NHL Entry Draft, Filppula has represented his native Finland on numerous occasions. He won the Bronze Medal with Team Finland at the 2010 Olympic Winter Games in Vancouver and also played in the 2012 IIHF World Championships. In 2004, Filppula was named a tournament all-star at the IIHF World Junior Championships.